Have you ever heard of negative gems in Clash of Clans? If no, then here is a situation where you might end up with negative balance of gems. Negative balance of gems in COC is possible in Android devices, where the refund policy in Google Play is very lenient for buyers. One of the most common way to have negative balance in Clash of Clans is to ask for the refund for your gem purchase. Suppose you have purchased 6500 gems in Clash of Clans accidentally, and later on you applied for the refund against that order, then Google will process you refund and your card will get credited with the paid amount. But later on Supercell will also remove the gems against which the refund has been processed. Now if you already have used the gems in the game, then it is possible that you will get a negative balance when Supercell will revert the gems purchase from you account. The screenshot of a similar negative balance base is provided below. You will also receive a mail in your COC inbox about this deduction of gems from your account that will go as follows. Negative gems in Clash of Clans simply means that you already have got the refund for those gems and the respective gems has been removed from your account to balance your refund and gems status. The screenshot provided above clearly shows that 6500 gems has been purchased and used and later the refund was processed for the same, therefore those 6500 gems has been debited from the game resulting in negative balance of gems. 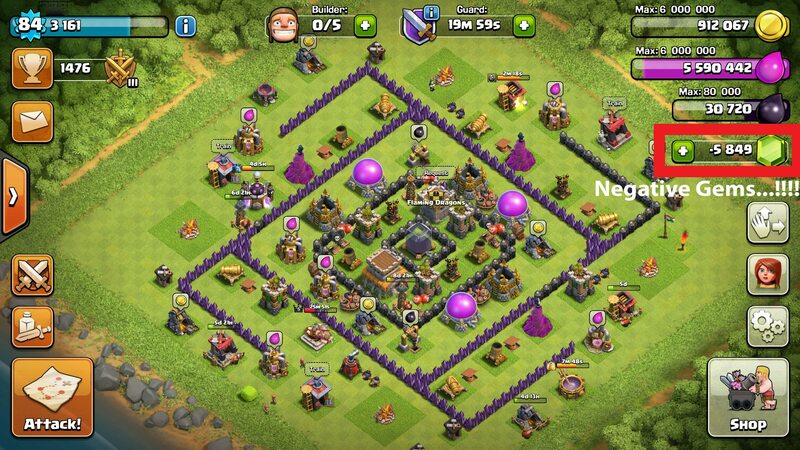 If there is any other situation where you have got negative gems balance in Clash of Clans, then do share it here. To get more updates on Clash of Clans and other Supercell games, stay tuned with us. My husband has a negative balance and never asked for a refund. He has been purchasing all gems through google. Just today went in and there is a -13000 gems on his game. He also got refunded to his bank account and he requested one….. what could of happened?? We are baffled by this.